I absolutely love when a room design project comes my way, so I was so excited when my friend Sarah of Handmade Mood blog asked for my help. By now I’ve done a number of room designs but this is the first time I’ve ever helped convert a formal dining room to a homework room AND the first time I got to style the room and see the final product in person! 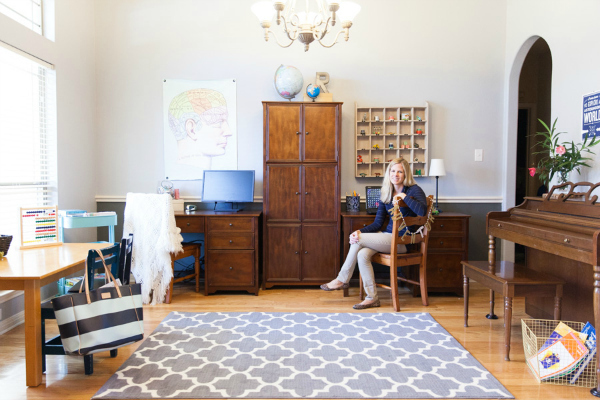 Introducing Sarah’s new homework room for her six kiddos! With a full house of school aged kids, working at the kitchen table wasn’t cutting it. 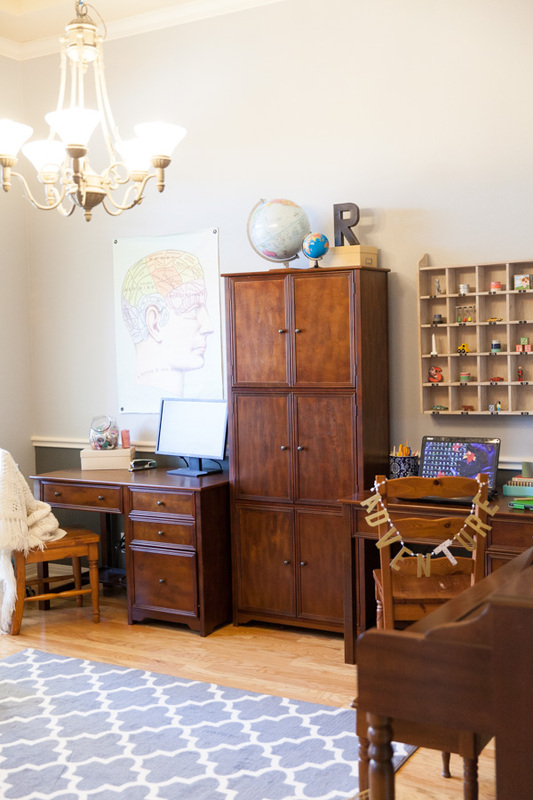 Sarah wanted a dedicated room where her kids could study and practice piano, with plenty of storage built in. Sarah was initially drawn to the idea of open shelves like these, and liked the look of a built-in desk and storage like this. While open shelves can look great when styled just right and kept oh-so-neat, I figured with six kids that would be next to impossible! So I encouraged Sarah to go for a set of these tall enclosed cabinets from Home Decorators. Then, to get the look of built-ins without the cost of a contractor or some serious DIYing, I flanked the cabinet with a matching computer desk on each side. Here’s the design I made for Sarah. I love how we were able to stick with the essence of the original design while incorporating a few new decor pieces Sarah had purchased (how cool is that big brain print?! ), and leveraging items from other parts of Sarah’s home. Tip: before you head out shopping to accessorize a new room, make a “shopping trip” around your house first to see how you can give old pieces a new life in a different room! 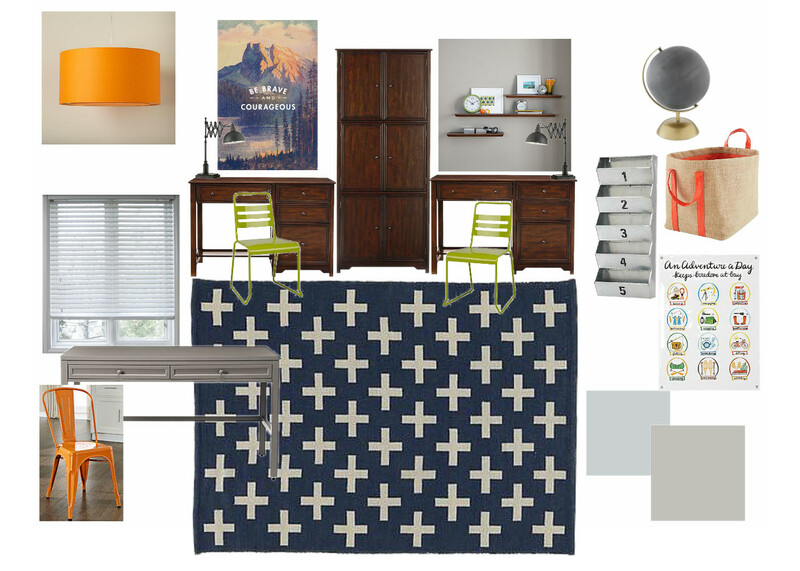 Sarah’s husband prefers the look of stained wood to painted wood furniture, so I made those pieces the focal point of the room, while adding pops of orange and green in the chairs and accessories. A few open shelves let Sarah still have some things on display without it being cluttered. A play table under the big window in the dining room allows the younger siblings to do their “work” alongside the big kids. Ok, that was sure fun – I’m ready to tackle my next room. Need some help? Shoot me an email and let’s talk! Photos by Amanda Raba Gentis.